Every time Bentley goes to visit Grandma and Grandpa, he gets lots of attention. Grandma makes him scrambled eggs for breakfast each morning and then gives him a new toy before he leaves. No one spoils you like Grandma! He is so adorable - what a perfect pose! 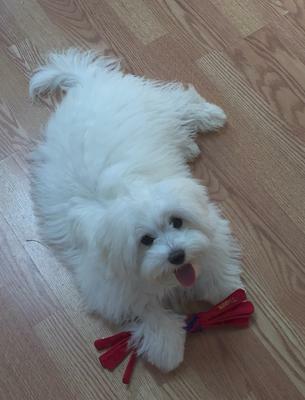 I have a male coton named Dino who will be 5 yrs. Old next week. He is spoiled also. If I could I would have more thsn one coton - they are such dedicated companions. Enojoy your beautiful puppy! Ah, so sweet and cute. Looks like my CoCo! His Grandma "Oma" lives with us. She's 93 and CoCo spoils HER! Yup, you heard right. . . When we got CoCo 11 months ago OMA wanted "nothing to do with puppies or dogs". Of course CoCo went right to work on THAT attitude. Within several weeks OMA slipped her words one day with puppy dog and I heard her whisper "I love you, CoCo". She taught him toilet training and he taught her "my Rudolf Toy fell on the floor Oma, can you get it for me?" She taught him "Shake, Shake" after brush grooming and CoCo taught Oma "kiss, kiss". Oma dipped her crusty bread into her 5:00 a.m. morning hot milk, took s bite, dipped the bread again and gave CoCo a bite, then it was Oma's turn for a dip & bite, over & over. When I roll over in bed, CoCo's gone every morning at 5:00 a.m.! Oma's window looks over the street. Every doggie that walks by each morning, Oma taught CoCo their name. Now CoCo has doggie friends galore! Oma teaches CoCo bum sniffing "stinky, stinky". . . So CoCo meets doggie C'zn on the street with a "kiss, kiss" instead! CoCo gets served "OMA Eggs" at 8:00 a.m. At 10:00 Oma & CoCo troddle down the lane to the "mail box". On June 21st, CoCo's first Birthday, the Post Man was there at the mail box - with a Pink envelope Card addressed "CoCo". Of course CoCo stood up on his two hind legs and reached for HIS mail wihen his name was announced by Mr. PostMan! And my iPad snapped that Kodac moment LIVE! Cans of people-food-ham, turkey or hotdogs is lunch for CoCo when OMA runs out of Bacon! Oma never let's his water dish get empty and for not liking doggies OMA sure knows how to tease "My doggie bone, My bone". By 1:00 p.m. CoCo is on Oma's bed, napping right beside her. Oma hides Rudolf, "Rudolf Hiding" and CoCo has to find him (and always does!). Of course Oma doesn't think CoCo should ride in the Car with me ALL the time I "go to store" - her words to CoCo: "Oma lonley when CoCo go Bye Bye"! Dinner is peas, yams & chicken, deboned by Oma's own fingers with plate on her lap & CoCo eating fried chicken bites from Oma hands. It gets worse. For desert CoCo gets "OMA ice-cream"! It gets even worse. Oma gets a WARM wash cloth and wipes CoCo's "Ice cream Face". CoCo tucks himself beside Oma's couch blanket, rolls on his back, paws-in-the-air and nodds off. When Oma goes "Nite, Nite" to bed, CoCo cuddles Oma's couch pillow for a very long time. It's those Toys, how many names can CoCo remember? !! how to bend their heads into that Coton pose, to win Grandma's heart! Now Oma and I each come up with our treat & tricks, as to get more of his love & attention, than the other gets. These Coton puppies sure know their Royalty lineage! Your puppy dog has that intelligent flirt look in his eyes that will fill you & Granda, both, with so much love for years to come. OMA now admits: "I can't live without him" as the toys pile higher in his "Toy Basket"! It's those dam eyes. . . penetrating. . . and transmuting Angel land. What a great topic Post you chose. You are just so adorable. You are meant to be spoiled! I bet Grandma and Grandpa hate to see you leave! Take Care, and keep on being spoiled! Connie and Charlie(another spoiled Coton)! You are adorable Bentley, it would be impossible not to spoil you! All dogs deserve to be loved and spoiled----especially cotons! Enjoy all your love and attention, my girls are totally rotten, lol. Way to go grandma & grandpa. Even as the owner as I have matured Jonah is more spoiled then when I was younger w/my others & they too were spoiled & Jonah turned out great. I certainly admit I was wrong. There is no such thing as to much spoiling. No wonder Grandma and Grandpa love Bently. He is adorable. I couldn't look at that face and not give him a big breakfast either. So sweet.